When I gathered my material (notebook, pen, New in Chess chess book, board and pieces) to start todays chess study my mind made a strange jump. It seems that Chris has another advantage in this challenge. Not only may he use Quality Chess books but his mother tongue is english, the language in which most chess books are written. My language is dutch, so I have to translate what I read. So maybe I must ask Chris to read only books in german? Jokes aside, I hope Chris has fun with this challenge. I am having a blast of a time. Never thought I would put so much energy into chess. Time flies. Dont even miss TV. Use every diagram as a lesson. My weakness is that my playing style is not active, attacking. I am rather a passive, positional player. Nothing wrong with that, but when I became this year rapid champion of my chess club everybody spoke praising words of my active, attacking style of play. 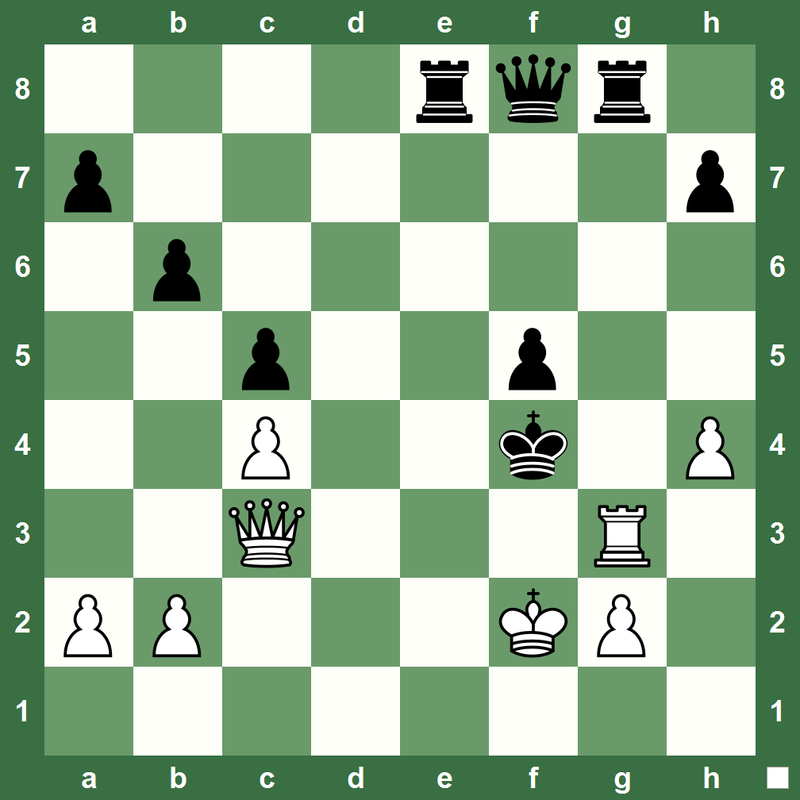 When I became this year blitz champion of my chess club I got again praise about my active, attacking style of play. When I play long time control games everybody talks about my boring, positional play, putting my opponents to sleep, ... . So my first goal is to get an attractive, active, attacking style of play in my long time control games aswell. This means that I have to improve my tactical play. I could do so by solving hundreds, thousands of tactical puzzles. But I sought another way. 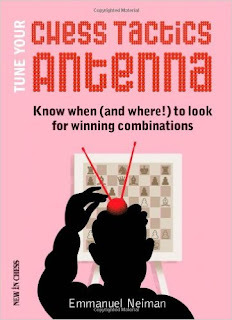 I think I found it with the New in Chess book: Tune your chess tactics antenna. In the 25 page introduction one gets already a nice diagram on the first page which I will give later in this blog post as an example. First I want to talk with you about the thinking process that Emmanuel Neiman discusses in these pages. Take a paroramic view without trying to grasp all the details, try to get a general impression. With other words, just get a feeling (some may call it intuition) of the position. What impression does it give you? Do you prefer white or black? Does it remind you of a simular position you know? The dissection of the position. This you can compare with Silman's imbalances or for the older players, the elements of Steinitz. Once you picked one or two, you can try and look for a combination, with the relevant theme in mind. With other words, time to make a plan! The selection of candidate moves should be made according to the general idea. We will choose the most forcing way to execute first, and then the second most forcing, ... . Previous examinations required good vision of the board. The final stage is just one of sweating. When we deal with forced moves (only moves) the calculation is easy. Sometimes we can find positions that are more complicated, and in this case, at each step, we have to return to step 4. Now lets give you an example. Here is the diagram I spoke of earlier. (If you want to solve it yourself first then dont read further until you found the solution). So lets try our new thinking proces. 2. 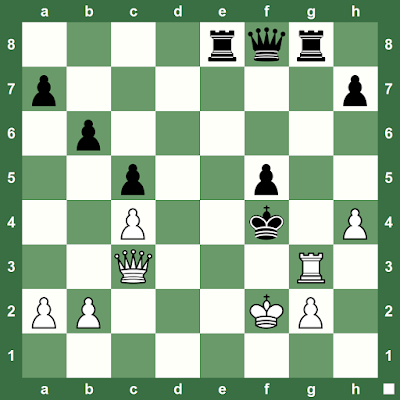 Analysis of the position: white is ahead in material. All his pieces are on white squares so the black bishop can do no harm. 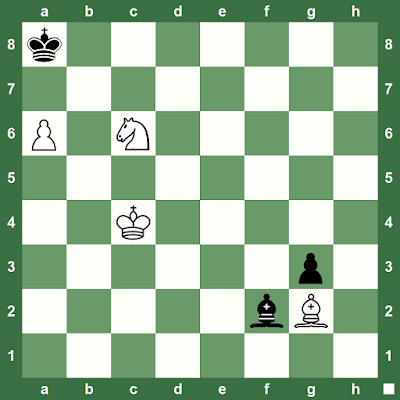 The black king has no legal moves thanks to the knight and pawn. 4. 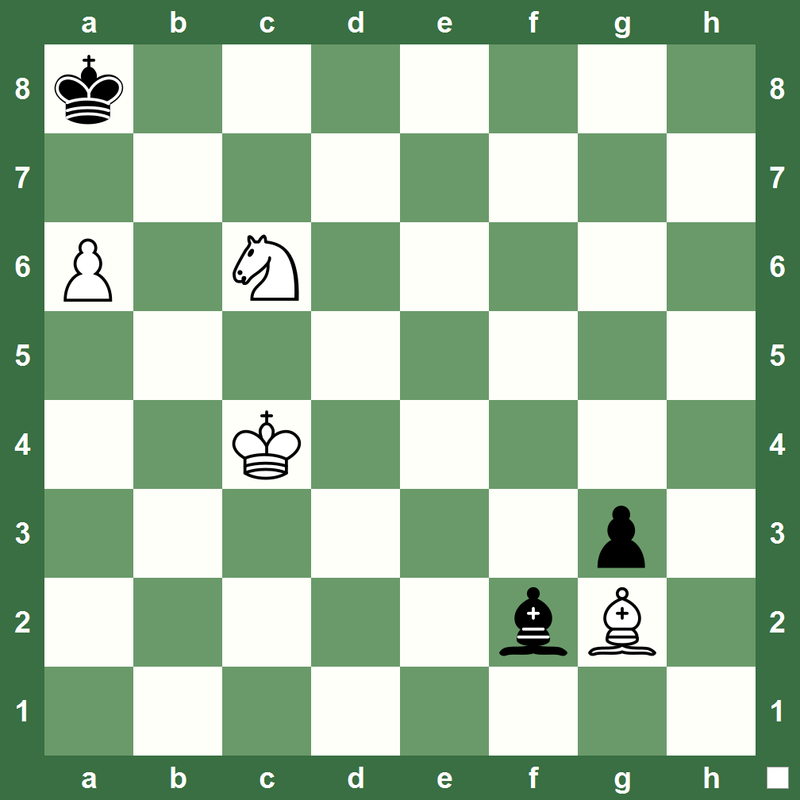 Looking for candidate moves: Since the black king has no legal moves one must just put the black king in check.We can do this with the bishop, so we must find a route for the bishop to get to b7 without moving knight or pawn. 5. The calculation of variations: Only one variation one has to calculate knowing the above. Now I will give you an exercise to solve, I will give the answer in a later blog post.